Months ago, I was invited to join ten other authors in creating a new book series that centered around quilts. I was all for that, not because I'm an avid quilter. I can't make those tiny, even stitches to save my life. However, I do have a great fondness for quilts, owning several made with love. Curious about the history of quilts, I decided to do a little research. A quilt, in its most basic element, is a cloth sandwich. It has a top, a bottom, and filling in the middle. The term "quilt" comes from the Latin culcita meaning a stuffed sack, but it came into the English language from the French word cuilte. The origin of quilting is unknown, but quilting, piecing and applique techniques were used for clothing and furnishings in early times of the world. The earliest known quilted garment was from around 3400 B.C., on a carved ivory figure of a Pharaoh of the Egyptian First Dynasty. In the 1920s, archaeologists discovered a quilted floor covering in Mongolia that dates back to around the first century B.C. Quilting came to Europe from the Middle East with crusaders in the late 11th century. Quilted garments were popular in the middle ages, particularly with knights.Not only did they provide a layer of comfort beneath armor, but could also be used to protect the metal from harsh elements. The earliest known bed quilt that has survived the ravages of time is from Sicily and dates to the 14th century. Made of linen and padded with wool, the blocks across the center are scenes from the legend of Tristan. 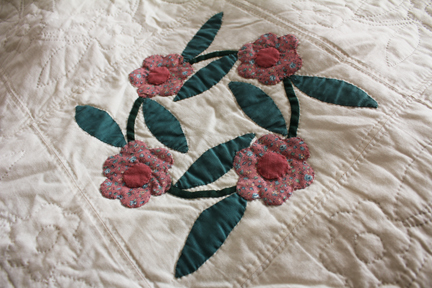 With the arrival of the English and Dutch settlers in North America, quilting took on a new life and flourished. 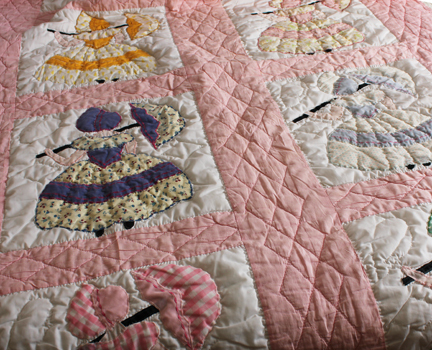 Primarily, quilts were used for warmth on beds, to cover doors or even windows to keep out the cold. In the early years of colonist life, quilts were plain, simple, and a necessity. Once fabrics began to be manufactured in America, women began turning something utilitarian into an intricate art form. Between 1750 and 1850, thousands of quilts were made, and many preserved. Some were so elaborate, years were spent making them. Those early quilts offer a wonderful glimpse into the history of quilting in the United States. The variety of patterns and quilt styles is as broad as the number of women who created them over the years. From whole cloth and applique quilts to patchwork and pieced covers, the only limits on quilt design seem to be the imagination. Although I don't quilt, I've been fortunate to know women who do. Both of my grandmothers quilted. 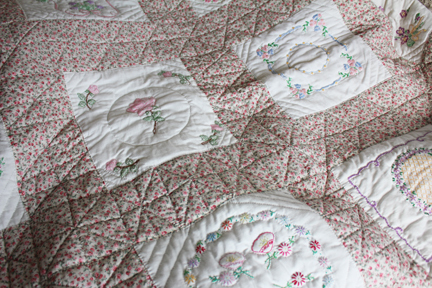 My granny made this Parasol Lady quilt for me when I was a little girl. It was the highlight of my very pink bedroom during my childhood years. 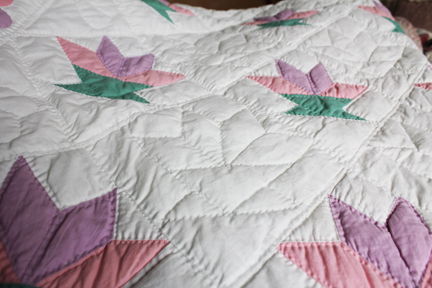 My Grandma Elsie started this Tulip Basket quilt for my mom back when she was in high school. Mom told Grandma she thought the colors were awful (in typical teen fashion), so Grandma never finished the quilt. One day we were at Grandma’s helping her clean and found a bag with the quilt blocks. Grandma gave them to me, so Mom put the top together and quilted it. When she get all done, she couldn’t remember why she thought it was ugly in the first place. The blocks for this quilt came from my beloved Captain Cavedweller's Grandma Nell. Her mother made the squares goodness only knows when but it had to be a long time ago. No one ever finished the quilt. She gave them to me and when we needed one more block to make the quilt work, Mom did the one with the pink rose (pictured top left of the above photo). Mom sewed the top, then did all the quilting. I should mention that Mom and both of my grandmas did their quilting by hand. No fancy machines for them. Grandma Nell made this stunning cross-stitched beauty for us one year for Christmas. This is the quilt my Granny made for our wedding. She let me pick the pattern and the colors then she and my mom pieced and quilted it. 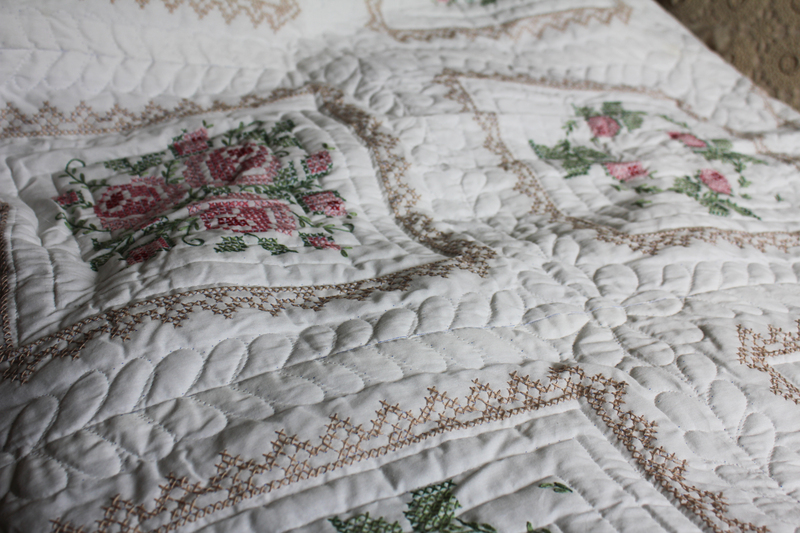 There was a lot of piecing and a lot of quilting and a lot of love that went into this Rose of Sharon variation quilt. 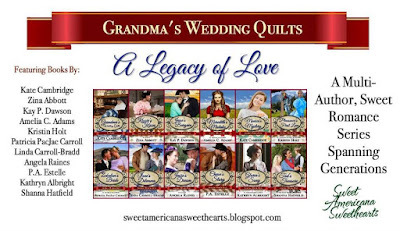 When I decided to participate in the quilt series book project, I knew immediately this was the quilt I wanted to use on my book cover and the pattern I would include in my story. 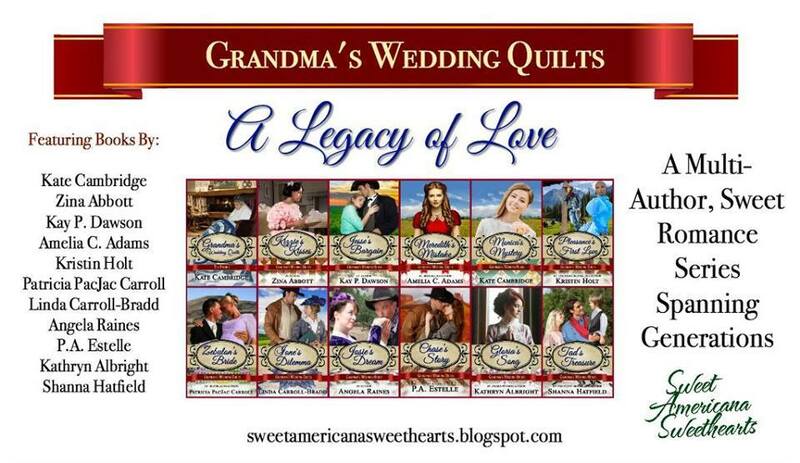 If you have a love of quilts and sweet romance, be sure to check out Grandma's Wedding Quilts. The stories span several decades and cover eleven cousins, all of whom receive a special quilt from their Grandma Mary. Tad's Treasure is also the prequel to the Baker City Brides series, so if you've enjoyed those stories, you'll want to be sure to read this sweet novella. Tad Palmer makes a promise to his dying friend to watch over the man’s wife and child. Years later, he continues to keep an eye on Posey Jacobs and her precocious little boy. The only problem is that he’s not sure his heart can withstand the vow he made when he falls in love with the widow and her son. Posey Jacobs misses her beloved husband, but her wrenching grief has given way to hope for the future as she finds herself falling deeper and deeper in love with Tad Palmer. However, the infuriating man doesn’t seem to notice her interest and treats her as he would his sister. Throw in a goat who thinks she’s a dog, a town full of quirky characters, and this widow has her work cut out for her if she wants one handsome cowboy to give her his heart. My bible study group is really into quilting so several times a year we go to lunch and then stop at a quilt shop near the restaurant. I have never had the time to make one, but I love looking at all the fabrics and designs. Quilting is really popular in MN right now. My grandmas and my mother-in-law used to make quilts and I have saved some of their best work. My mother crocheted an entire bedspread and it is beautiful! I can't imagine the discipline it took to put it together. 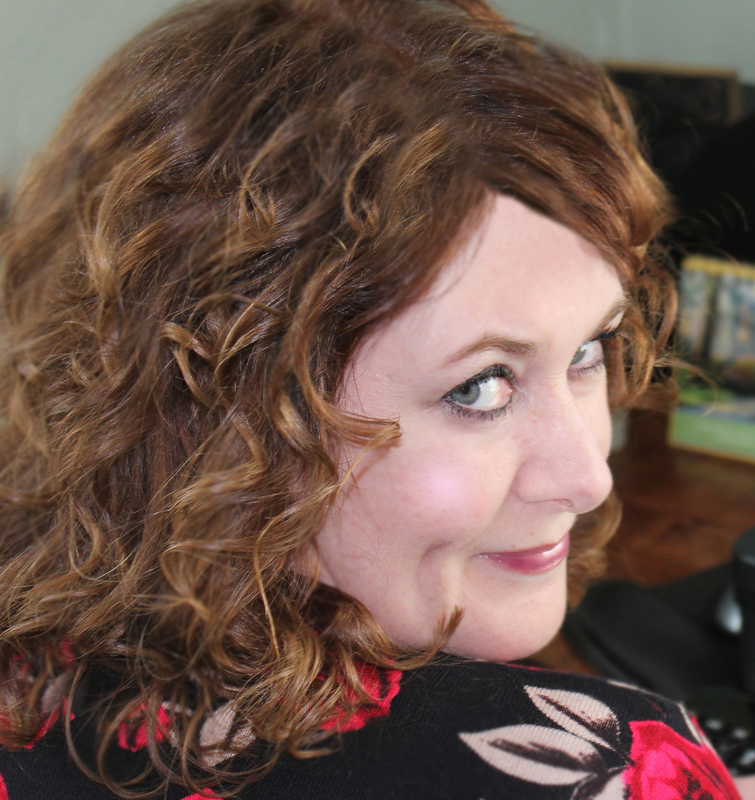 Your quilts are beautiful, Shanna! what a wonderful outlet for your creativity. Those quilts are just gorgeous! I have one my great grandmother made for me and it's really special. I personally don't quilt, though I sure wish I knew how to. I think it'd be a wonderful thing to make gifts like that for my kids and grandkids. I loved seeing all your quilts, Shanna! And I did not know that the sweet lady on the cover of the prequel is your mom! That makes it so much more special! How fascinating. I never knew quilting went so far back in history. I love history. Thanks for sharing! Thanks for sharing the quilts. They are lovely. Your quilt images are gorgeous, Shanna. And I learned something new (I always do when reading your blog articles)-- your mother, a cover model! 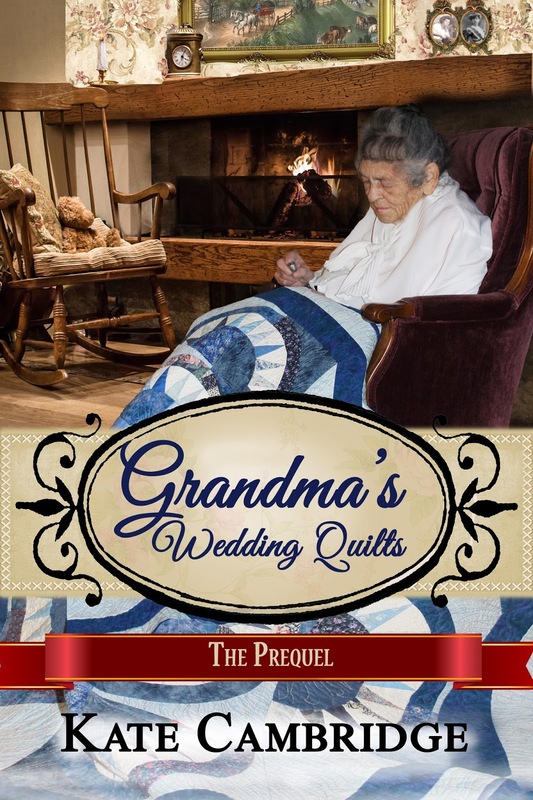 She's PERFECT for Grandma Mary, for the Grandma's Wedding Quilts Series. 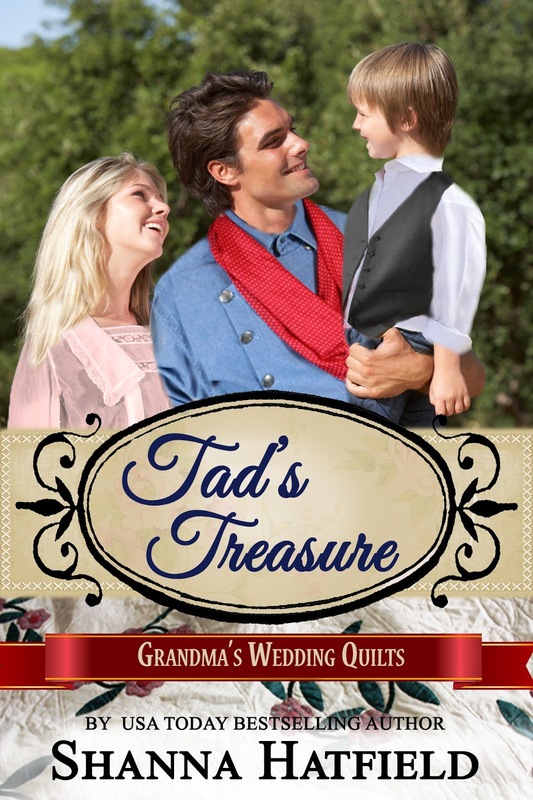 Your story, Tad's Treasure, is one I'm definitely looking forward to reading. I'm honored to have been involved in this multi-author series with you. Wow, Shanna, so interesting! The quilts are beautiful and your mother as a cover model is fantastic! I really enjoyed your post. I do not quilt, but helped my granfmother lay out patterns. She mad each grandchild a quilt. She slept under each quilt one night before it was given away. 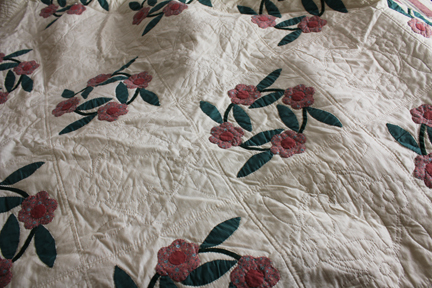 Some quilts were designated for a particular person after she slept under it. I reached mine as it was a very warm, heavy quilt. I would pile my bed with quilts when I lived with her!!!!! Oh, that's wonderful your grandmother made quilts for each grandchild. What a precious keepsake!